Beethoven wrote only two ballets. For the first - (Musik zu einem Ritterballett) - he acted as a ghost writer for Count Waldstein, who paid the young composer well to write music which he passed off has his own work in 1791. The second was the Creatures of Prometheus written in 1801 between the first and second symphonies. The choreographer was Salvatore Viganò (1769-1821), a Neapolitan ballet master famed in his time for simplifying the exaggerated and artificial movements and gestures that characterised the old Italian style of dancing. The Empress Maria Theresa appointed Viganò master of the ballet in Vienna in 1799. Each year he produced an original piece for the Imperial Court, the Creatures of Prometheus being his third production. The story of the ballet is little more than an improvisation on classical themes - an excuse for set-piece dances. Prometheus creates a man and a woman from clay and water, and brings them to life with a fire brand taken from the sun. His intention is to combine all the best qualities of the animals, but he fails to give them the power of reason. He wants to destroy his creatures, but Apollo rescues them and takes them to Parnassus, where they learn music. Melpomene, the muse of tragedy, teaches them sorrow, Thalia, the muse of comedy teaches them to laugh, Terpsichore teaches them to dance, and Bacchus, introduces them to the pleasures of revelling. The creatures finally appreciate all the beauties of nature, and with one last solemn dance they embark on the journey of life. The ballet was given its first performance on 28th March 1801, and was initially successful, being performed sixteen times in its first year. However, Viganò eventually went out of fashion and, despite Beethoven's excellent music, the Creatures of Prometheus fell into obscurity and is now rarely performed except for the overture which has always remained a popular concert piece. 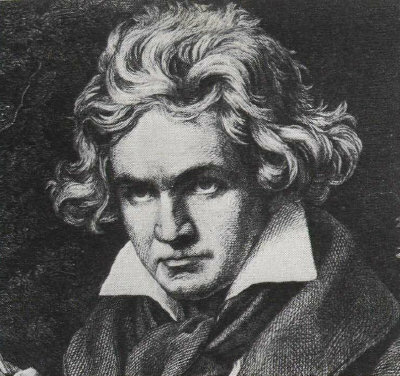 Beethoven reworked some of the music of the ballet in other pieces, most famously in the final movement of the eroica symphony. The overture is symphonic in nature, freely using sonata form, and is highly dramatic with bold changes of key and dynamics. After a slow introduction an energetic first theme is introduced first quietly by the strings and then in a dramatic blaze of colour from the whole orchestra. The second theme is quieter and gentler but the energetic quavers return to bring the exposition to an exhilarating close. There is no repeat of the exposition, as there would be in a symphony, and the development section is very short. The recapitulation is in contrast considerably extended with a long coda. Music from the overture was also used in the finale of the ballet. Beethoven's overture to The Creatures of Prometheus was performed by the Portobello orchestra on the 1st April 2006. The conductor was Anthony Weeden.